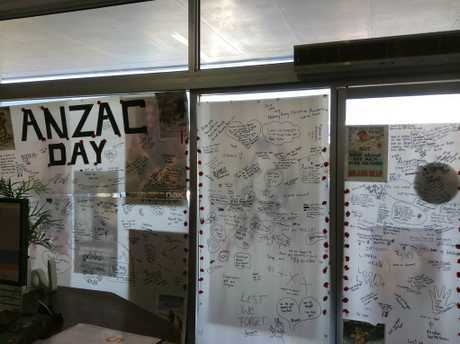 MESSAGES to the Anzacs and those who have served since WWII were scrawled onto Genesis Hair Creation's paper tacked windows. While Anzac Day as passed for this year, the community's support for the Diggers lives on in the scribed text. 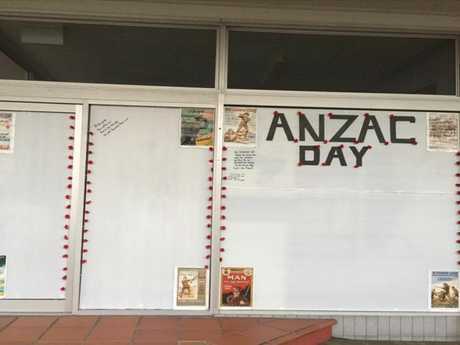 Owner Rebecca Rae explains in her Your Story why she plasters paper onto her salon every Anzac Day. The idea first came about four years ago. It was one of my client's ideas and I thought it would be something great for the community as a way to pay tribute to our diggers past and present. It was so touching the first year turning up to the salon late in the afternoon to take it down and the whole board was filled with messages. Reading the messages brought tears to my eyes and from that Anzac Day onwards, I knew I had to keep the tradition going. Every year since, I have come up with new designs for the window. When we were putting it up before the dawn service this year, a little boy walked past with his dad and he said "is that the place where you write stuff on?". That made me smile and it made me feel glad that I've decided to continue doing this. It's nice to see the Anzac spirit still runs strong in this community. Next year it will be even bigger and better.